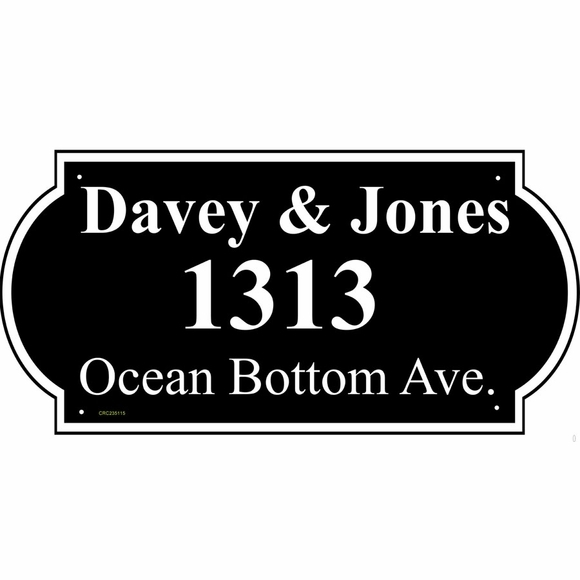 Large Personalized Home or Office Address Sign - - holds three lines of personalization. Enhanced rectangle shape. Wall mount. Made in USA. Extra large address sign is ideal for a professional office or home office, as the large characters on the top lines are easier to see from a distance. Customized with your choice of color and the name, address, and/or additional information you specify. Characters and border are permanently engraved into the sign during the production process not painted or printed on. Line 1 holds up to ten (10) 2.5" characters. Line 2 holds up to 10 (10) 3" characters. Line 3 holds up to sixteen (16) 1.5" characters. If you are not using all the lines, please leave unneeded input boxes empty. Nine vivid color combinations: sky blue with white characters; black with white characters; black with gold characters; white with black characters; brushed gold with black characters; brushed stainless with black characters; kelley green with white characters; red with white characters; and yellow with black characters. Border is the same color as the personalization and accentuates the enhanced rectangle shape. Comes with four 3/16" diameter fastener holes and stainless steel mounting screws. Dimensions: 23.5"W x 11.5"H x 1/8".